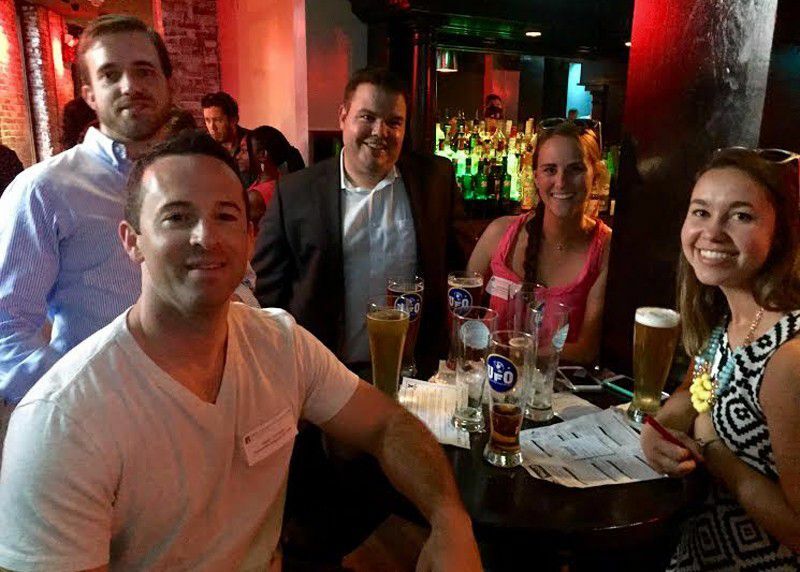 Over 100 young professionals gathered at Bell in Hand on Wednesday July 29, 2015 for YPEM's Annual Trivia Event, presented by American Personnel. The entertaining evening welcomed almost 30 teams who battled in a friendly stump trivia competition in support of the fight against cancer. Attendees were welcomed to the event by Executive Director, Frank Heavey, who thanked everyone for their support and spoke to the mission of Expect Miracles Foundation. A member of the YPEM Leadership Team, Brian Rudenauer, then shared some words on his experience as a member of YPEM and why, based on his personal history, he felt the need to become actively involved. Brian spoke to the importance of continuing to rally the financial services industry to invest in cancer research, in the hope that one day every cancer will have a cure. Trivia kicked-off shortly thereafter with questions ranging from geography and history to sports and pop culture. Attendees enjoyed drinks, appetizers, and lively conversation throughout the night and all players were entered to win tickets to the upcoming Kenny Chesney and Jason Aldean concert at Gillette Stadium, Boston Red Sox tickets, and a set of Puma Soundchuck Bluetooth speakers. Congratulations to our trivia champions, Four Score and Seven Beers Ago! In a close match, #herefortheapps and We Are All Single At This Table came in second and third place. With record breaking attendance and fundraising, we are greatly looking forward to our next event, the Expect Miracles Kan Jam Classic, which will take place at Boston Athletic Club Thursday, September 17. To learn more about this upcoming event click here, or contact Maggie Nokes at mnokes@expectmiraclesfoundation.org.